This weekend I found myself in the Mall. Not really the best place for someone who is trying not to shop to be, but my Sister needed my help in finding her First Day of School Outfit - something I have done for the past three years. Though she doesn't necessarily love my style, she does feel hopeless without my suggestions, that she can then 'tone down' for her taste. We ended up getting a creamy crochet-lace dress from H&M and I cajoled her into belting my leopard scarf over it to dress it down. She isn't sure her peers will be accepting of a belted scarf, but I assured her that everyone cool on the interwebs has done it. I'll post a photo if she lets me! As for me, I must note that I did give myself a budget for the remainder of August of $40, and while I was trying very hard not to, I did make a few purchases at the Mall. A pair of sunglasses, nearly identical to the pair I've been stealing (I mean borrowing) from my Sister from Aldo, on sale for $8. And then I went into Old Navy and happened to see the exact striped shirt I've been looking for, with stripes that don't go all the way to the top, and I did have that 30% off coupon, so the top was only $11 - which met my criteria of being under $15! And that is all I bought! Saturday morning I went to an antiques fair and spend three hours hunting table after table, looking for any little gems, but found nothing I wanted that was a reasonable price. One thing I did see was a set of vintage Pyrex mixing bowls. I have a strange love of Pyrex. Really. I wanted them, but the seller was asking $65, and that seemed crazy. I decided to check out eBay (you know, that very instant on my iPhone) and found an identical set with a current bid of $25. I decided to bid on them and got outbid. But there doesn't seem to be a shortage of them out there, so I'll get the bowls eventually. New sunnies in action, and (finally) wearing the white dress I shortened last month. Also wearing two "back of the closet items" today, the sequined tank is the second. It was really cheap, $3, I think, but can not be worn on its own, and the straps need to be shortened. Today I just pinned them. Great Shades :) !! I too have a love of vintage pyrex bowls and haven't got my hands on a set yet - mostly because the flea market vendors really do overcharge! Love the Old Navy shirt -- I've been looking for a similar one myself! I'm going to Old Navy tomorrow in hopes of finding that shirt! You rock for getting it at a great price! Your outfit is totally cute btw! Such a sucker for a dress here! I have those exact same sunnies but I got mine off ebay. They're perfect! 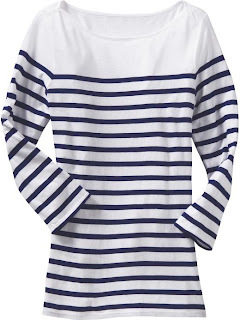 I also love the shirt you brought, nautical is a fav trend of mine. Love those sunnies on you! perfect! I love that self-shortened white dress! It sounds like you did a great job of keeping within your budget! I'm a sucker for all white dresses, but I really love yours. It looks fantastic with the brown belt! I've been looking for the same shirt! 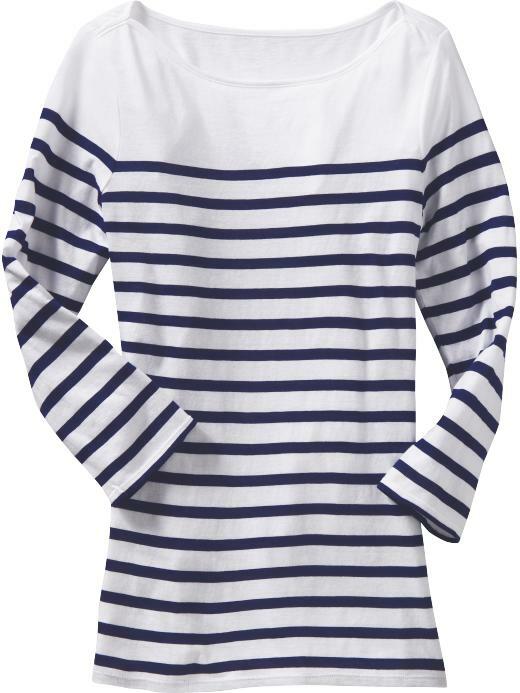 Boatneck with stripes. Sailor like. I'm gonna go buy it! Soon! Nice purchases, and way to stick to a budget! My mom got that exact set of Pyrex mixing bowls as a wedding present, but the only one that survives is the red bowl. I'm not entirely sure what happened to the other 3, but the red one is still in great shape 36 years later! Cute summer outfit. I like the length it has now and your flipflops are so cute, too. Nice job at the mall! I've never banned myself from shopping (or even limited consciously) I think I'd end up spending money in spite of myself..lol. Great dress! The shape is perfect and so flattering! I love your new sunglasses! And I wouldn't mind a striped top like that too. I love your sparkle shirt under your dress, and your sunnies are indeed the epitome of badassery. That look reminds me to appreciate summer! I love this old navy shirt. So so cute and great outfit! That dress is gorgeous on you!! Loving your new buys too :) Nothing beats a bargain, especially if you wanted to buy it at full price! good for you for sticking to a budget-can you help me??? I dropped and broke my clearance Old Navy Jackie O's this moring I just bought 2 weeks ago when I was in the States-so bummed-can't find those here! You did well on your budget. Pyrex bowls? On eBay? I do love crockery but not that much!! Did your bid win? That ensemble is so pretty. I have been trying to wear a lot more feminine pieces before the end of summer. I know I will regret it if I don't. There's no going back after october. the old navy shirt is a great find! 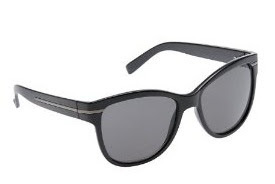 great deal on the sunnies. and cute dress! Those sunglasses are such a fabulous find! I was just thinking that I need a new pair! Could you live with 100 items?